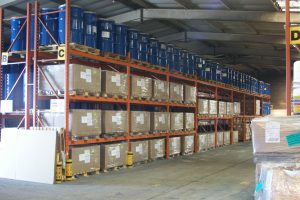 Witton has indoor warehouse storage in excess of 1000m2; there is also a large amount of free standing area for drums and IBCs, with a covered area available for monomer storage. For temperature dependent materials we have a 20m3 heated storage at 25°C, 3x60m3 heated storages at 60°C and a 20m3 refrigerated storage at -15°C. There is over 450,000l of capacity for bulk storage for both raw material and finished product. We also have hot water jacketed bulk storage which can be heated to 85°C. To allow the easy weighing of bulk tankers, we have an onsite weighbridge of 50 tonne capacity. The weighbridge is calibrated to M1 standard. There is a loading ramp to enable the easy loading of shipping containers.